Canadian company Ecobee’s long-awaited Switch+ Alexa-enabled smart home light switch, is now available for pre-order. The Switch+ is set to hit store shelves in Canada on March 26th for $119 CAD. The Switch+ supports lightbulbs from a variety of smart home light manufacturers, including Lifx, Philips Hue and other major smart bulb makers. Along with Alexa integration, the Switch+ supports far-field voice integration with Apple’s HomeKit, Google Assistant and Samsung’s SmartThings smart home platform. The smart light switch is also capable of IFTTT integration, which is great for those who like to more heavily customize their smart home setup. Coupled with voice control are motion and daylight sensors, allowing the smart lights to immediately turn on when movement is detected in a dark room, or for the light source to turn off automatically when the sun goes down. Of course, as you might have expected, the Switch+ also includes a built-in standard light switch, though in some ways, this defeats the purpose of owning a smart light switch in the first place. The Toronto-based company says it’s possible to install the Switch+ in roughly 30 minutes and that the Switch+ includes step-by-step illustrated instructions designed to ensure the setup process goes smoothly. 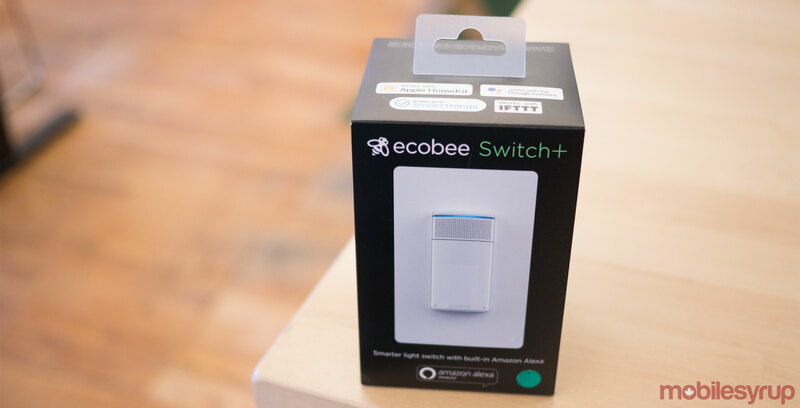 Ecobee also says that the Switch+ works with any light controlled by a Switch and that it supports most energy-efficient lightbulbs. Specifically, the Switch+ is rated to control 600w incandescent or 150w LED and CFD lights. Given that the Switch+ features both Alexa and Google Assistant integration, the device is capable of much of the same functionality as Google Home and the Ecobee4. For example, it’s possible to ask the Switch+ to set a timer, for the weather forecast, as well as read the news, all through Amazon’s Alexa voice-activated assistant. “The launch of the Ecobee Switch+ is just the beginning of our plan to become the connected home leader in North America, and one of many steps we’re taking to make voice control a seamless and natural part of home owners’ every day lives,” said Stuart Lombard, Ecobee’s CEO and co-founder during a recent interview MobileSyrup. The Switch+ smart light switch is compatible with both iOS and Android. The company’s last smart home device was the Alex and Google Assistant-enabled Ecobee4 smart thermostat. We’ll have more on Ecobee’s Switch+ in the coming weeks, including a more detailed feature about the smart home accessory.